Family-run with modern amenities & excellent services, Lavris Hotels are located in an ideal place to start exploring the island of unparalleled, largely unknown contrasts. Magda Hotel is a four-star hotel in Crete, that was built in 1993 and renovated recently. With soft colours and flowers, this hotel's style and atmosphere will make you feel comfortable, just 80 metres from a beautiful sandy beach and 200 metres from the resort centre. This charming and traditional hotel offers something for everyone; relax around the pool, take a short walk down to the beach or head to the old town of Rethymno, which is just a few minutes away. The friendly and attentive staff will ensure you have a memorable stay at The Artemis Palace. Its privileged location on the beach makes the Iberostar Creta Panorama a great hotel. Guests can rest and have fun at the same time while enjoying unforgettable sea views and there is also exclusive access to two private coves for an indulgent and relaxing dip. Situated in well kept gardens with stunning sea views, this hotel is ideal for those looking for a relaxing break with plenty of facilities on offer. The Sentido Pearl Beach Hotel is situated right on the Rethymnon beach. It has 2 swimming pools with free sun beds, and a fitness centre with indoor pool and hot tub. The private beach is directly in front of the hotel and is awarded the European blue flag for its crystal clear waters and organization. 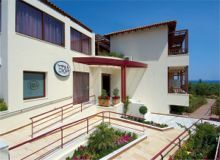 Eria resort is the first hotel in Greece, that has been designed to offer the most pleasant and comfortable holidays to with accessibility needs, their families and their escorts. The Hotel first opened in June 2004.